Hotel Balaton is a 3 star hotel in Riccione managed directly by the owners, a short distance from the beach and the spa. It has parking, garden, WI-FI and air conditioning. It is suitable for families with children, to whom many services are dedicated. The hotel accepts small and medium-sized pets. The structure is located in Riccione, five minutes from the beach and from the Spa establishment which also includes the Perle d'Acqua Park thermal park. Just ten minutes walk you can reach Viale Ceccarini, full of bars and shops. All rooms have a balcony, air conditioning and WI-FI, safe, telephone, TV with satellite channels, complimentary toiletries and hairdryer. New 2018: all the bathrooms have been renovated and all have a shower. STANDARD : equipped with all the comforts and basic services, you can request breakfast served in your room, mini bar on request at extra cost. SUPERIOR : more spacious and spacious, with all the services of the standard rooms, plus a mini-bar. FAMILY : available rooms for families and large groups. Garden, free bicycles, living room with satellite TV and newspapers available, bar, elevator, beach towel in free use, entertainment with theme nights, special aperitif every Sunday and Romagna dinner once a week. PARKING: uncovered and private, subject to availability, garage with single car garage. AIR CONDITIONING : in all rooms and in the common areas. CONVENTIONS : beach, amusement parks, discos, gym, spa. Possibility of organized excursions. LUNCH AND DINNER : local cuisine prepared by the chef and the owners, 3 menus with choice of meat and fish, appetizers and vegetables, pasta and homemade desserts. OTHER: every Sunday special aperitif offered and once a week typical local dinner. In hotel: outdoor playground area, strollers, baby sitter service and pediatrician. In the room : cots, cribs, anti-fall rails, baby baths. At meals : flexible hours, high chairs, baby food, baby menu and meals prepared according to the instructions of the parents. On the beach : playground area, baby toilet, nursery with changing table and tub with hot water, anti-seize bracelet. 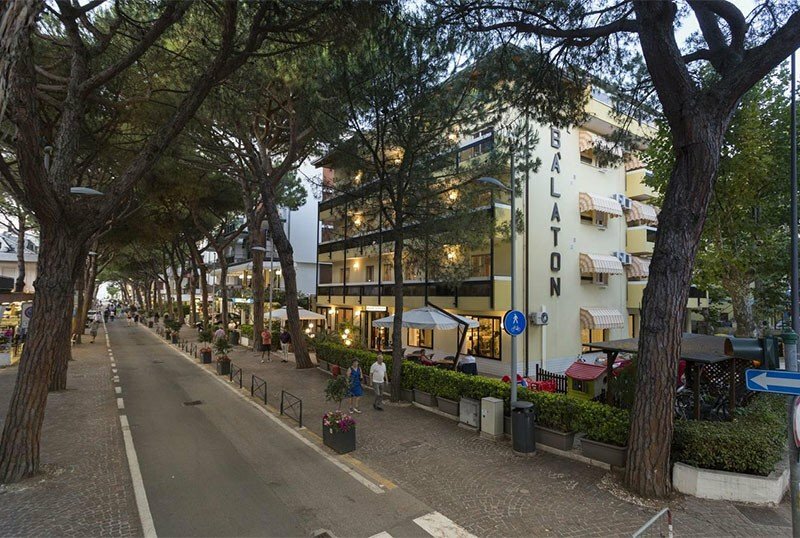 Hotel Balaton has an agreement with the beach resort 53 in Riccione. Here are available services for children, disabled, playgrounds, reading corner, WI-FI, cabins for exclusive use and free beach towel. The prices of the price list are per person per day for a min. 3 days. Do you want to spend your next June vacation in a quiet area? The Balaton hotel is ready to welcome you. For the week from June 16th to June 23rd we are offering you an amazing offer! In All Inclusive Formula starting from € 429.00 per person. Call to receive a personalized quote! 1 DAY FREE: STAY 6 DAYS, THE SEVENTH WE GIVE YOU US! Discover the pleasure of being our guests, from 18 May to 9 June and also from 1 to 30 September! For a minimum stay of 6 days the seventh day is completely FREE! Special offer for the summer New Year in Riccione. in full board starting from € 68.00 per person. Special offers for families and discounts for children. If you prefer the All Inclusive treatment, with admission to the water park "Water Pearls", Beach Service and drinks included, you just need to add € 8.00 per person per day. Call to find out the right offer for you. Week end of July to all fun with Free Park! Package from 27 July to 3 August, in Full Board Formula, € 68.00 per person per day. Family Plan: 3 paying one for FREE. Contact us and we will find the right solution for you. Waiting for August, book a week in All Inclusive € 76.00 per day per person + free entry to the thermal park "Water pearls".